Abstract. 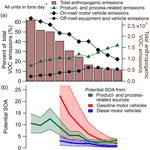 Decades of policy in developed regions has successfully reduced total anthropogenic emissions of gas-phase organic compounds, especially volatile organic compounds (VOCs), with an intentional, sustained focus on motor vehicles and other combustion-related sources. We examine potential secondary organic aerosol (SOA) and ozone formation in our case study megacity (Los Angeles) and demonstrate that non-combustion-related sources now contribute a major fraction of SOA and ozone precursors. Thus, they warrant greater attention beyond indoor environments to resolve large uncertainties in their emissions, oxidation chemistry, and outdoor air quality impacts in cities worldwide. We constrain the magnitude and chemical composition of emissions via several bottom-up approaches using chemical analyses of products, emissions inventory assessments, theoretical calculations of emission timescales, and a survey of consumer product material safety datasheets. We demonstrate that the chemical composition of emissions from consumer products as well as commercial and industrial products, processes, and materials is diverse across and within source subcategories. This leads to wide ranges of SOA and ozone formation potentials that rival other prominent sources, such as motor vehicles. With emission timescales from minutes to years, emission rates and source profiles need to be included, updated, and/or validated in emissions inventories with expected regional and national variability. In particular, intermediate-volatility and semi-volatile organic compounds (IVOCs and SVOCs) are key precursors to SOA, but are excluded or poorly represented in emissions inventories and exempt from emissions targets. We present an expanded framework for classifying VOC, IVOC, and SVOC emissions from this diverse array of sources that emphasizes a life cycle approach over longer timescales and three emission pathways that extend beyond the short-term evaporation of VOCs: (1) solvent evaporation, (2) solute off-gassing, and (3) volatilization of degradation by-products. 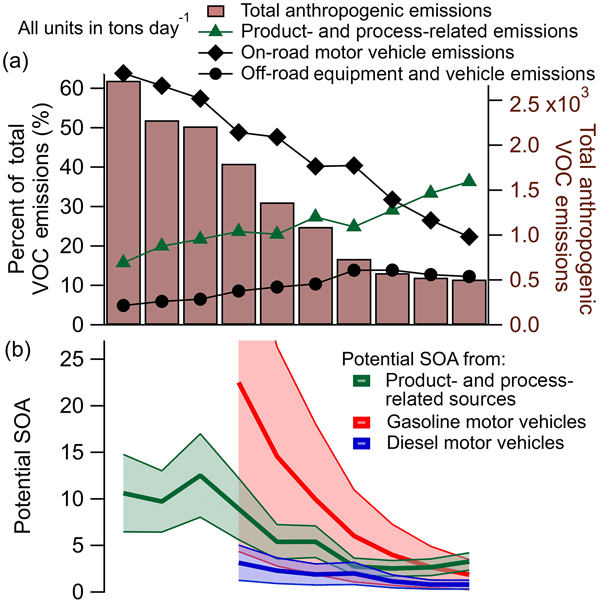 Furthermore, we find that ambient SOA formed from these non-combustion-related emissions could be misattributed to fossil fuel combustion due to the isotopic signature of their petroleum-based feedstocks. How to cite: Khare, P. and Gentner, D. R.: Considering the future of anthropogenic gas-phase organic compound emissions and the increasing influence of non-combustion sources on urban air quality, Atmos. Chem. Phys., 18, 5391-5413, https://doi.org/10.5194/acp-18-5391-2018, 2018. Following decades of successful regulatory policies focused on combustion-related sources (e.g. motor vehicles), emissions from non-combustion sources have become increasingly important for urban air quality. Using multiple approaches, we demonstrate that emissions from consumer, commercial, and industrial products and materials have become prominent contributors to the formation of photochemical smog (i.e. secondary organic particulate matter and ozone) and its associated health effects.